"Men may keep a sort of level of good, but no man has ever been able to keep on one level of evil." E.R. 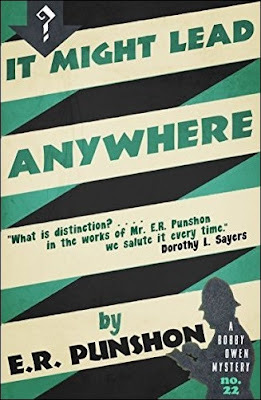 Punshon's It Might Lead Anywhere (1946) is the twenty-second entry in the outstanding Bobby Owen series, currently the Acting Chief Constable of the Wychshire County Police, which enmeshes him in a religious rivalry and a brutal murder in an otherwise peaceful place – one that actually falls outside of his jurisdiction. But when has that ever stopped one of our beloved detective characters from poking their nose where it doesn't belong? Exactly! The backdrop of the book is an ancient borough, Oldfordham, with "a charter granted by one of the early Plantagenet kings" and "the mayor's chain of office dated from Saxon times," but has since shrunken in size and importance. However, it still boosts a practically non-existent crime rate and the last person who died there by a murderer's hand was nearly a century ago. Well, that changed shortly after Owen had to intervene in a neighboring village, Chipping Up, where he managed to quell a near riot between the locals and an ex-boxer turned revivalist preacher, Duke Dell – who constantly preaches about what he calls "The Vision." Dell's preaching had an effect on one person, Alfred Brown, who was a quiet, inoffensive recluse, but recently he has began disturbing church services. A sustained protest against what he called "popish practices." The former prizefighter also had been annoying everyone "by a general and sweeping denunciation" of the villagers and their ways. So, when Owen first lays eyes on the preacher he stands on the banks of a stream, "roaring defiance," as a hostile crowd surrounds him. Dell promises he would cast anyone in the water who would approach him and Brown had already been flung into the stream, but that was accidental. Regardless, the miser nearly lost his life in the fall and his face is bruised and bloodied. Owen succeeds in defusing the situation and prevents an old-fashioned free-for-all, but the incident is brought back to his attention on the following day when he reads in the Midwych Courier about the discovery of Brown's body at his home in Oldfordham – brutally beaten to death with a heavy kitchen poker. Oldfordham has its own, small police force and the investigation is in the hands of Chief Constable Spencer. However, the case has piqued the interest of Owen and craftily wormed his way into the investigation, which he eventually completely takes over after Spencer gets sidelined with a splitting headache (i.e. attempt on his life). But the case is far from a cakewalk. Despite the sudden unset of religious mania, Brown was a lonely recluse and everyone seemed surprise when the police found a stash of gold sovereigns underneath the floorboards of his cottage. So nobody really seemed to have had a motive and the clues were severely lacking. And that's one of the admitted short comings of the book. More than halfway through the book, Owen acknowledges "that he had not been able to find a single material clue" and all he had to show was "psychological stuff." The role of the various characters played and their hidden, interlocking relationships. Obviously, the near fatal incident at Chipping Up makes Dell one of the suspects, who may have been guided by his vision, but Brown's railing against Roman practices also placed Rev. Alexander Childs, Anglo-Catholic vicar of St. Barnabas Church, among the suspects – since an attempt of the vicar to make peace ended with a teapot thrown in his direction. Brown also appears to have past ties with a local solicitor, Maurice Goodman, who has a new secretary, Miss Theresa Foote. A pretty, flirtatious young woman who's acquainted with one Mr. Langley Long. Long "bore an odd family resemblance" to a Flight-Lieutenant or the Royal Australian Air Force, Denis Kayes, who was present at the skirmish that opened the book. And he was very reluctant to give his name to Owen. The plot largely hinges on these relationships and how they could have lead to the barbaric bludgeoning of Brown, however, one or two genuine clues eventually turn up. One of them has to do with the radio broadcast Brown was listening to on his expensive wireless, but completely missed the significant hint Punshon attached to this. So the plot offers an actual detective problem to the reader, but the problems requires experience and intuition as much as deductive reasoning. Anthony Boucher praised the characterization, gentle humor and the logical working out of the murder, but noted that the story seemed ponderous. I think this has to do with Punshon concentrating on simply one story-line: the reasons for murdering such a harmless old miser as Brown. Usually, Punshon prefers to manipulate multiple plot-threads with the nimble fingers of a master puppeteer, but here the plot is very slender and focused on just one problem. A problem that comes with a number of complications, such as a hoard of gold and the religious angle, but a single problem nonetheless and Punshon has a rather verbose, ornamental writing style – which can easily make a story with a trimmed down plot look ponderous in comparison with previous entries in the series. That being said, I still very much enjoyed It Might Lead Anywhere. But than again, I've become a great admirer of both Punshon and Owen. I think some of the minor shortcomings of this particular title won't deter other fans from enjoying it either, but I would recommend new readers to begin somewhere else in the series. Such as Information Received (1933), Death Comes to Cambers (1935), Ten Star Clues (1941) and There's a Reason for Everything (1945). Or do what I should have done and read them in order, but that's entirely up to you. 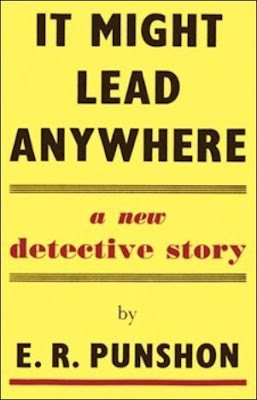 But you should give the series a shot, because it's one of the great detective series from the Golden Age.